Hamilton Back in USA. Hamilton strongly recaptures a place on the Russian market. Hamilton strongly recaptures a place on the Russian market. The company intends to introduce new versions of its finest hours, some of which could be called a “secret weapon”. Hamilton – the American company, and for a long time she has worked only in the U.S. and Japan. Then were added to several European countries, but to conquer the world of this hour was not enough. The first step in the “promotion of the east” was made in 1974 when the brand became part of the Swatch Group. But even then, the world’s biggest concern is not just time undertook to reform the company. Hamilton and remained highly specialized tag is too “American” for the international market. The changes began six years ago, when the Swatch Group has decided to move the company headquarters and all production from the U.S. to Switzerland. The solution turned out to be very successful. The fact that this brand has been around for more than a hundred years old and she does not need to invent any “legend” of the image. Over the years the company has managed to take shape his own style, which she holds today. Slightly updated, popular models of the past and today continues to attract the attention of hundreds of thousands of customers. For example, still sells excellent series Khaki, which appeared during the Second World War and was originally intended for the U.S. Air Force. By the way, the new collection, which will be in stores after the Basel exhibition, there are also variations on the theme of war. This watch is Khaki Officer 44 mm with a round face, big numbers and durable strap which is made from a deliberately rough skin. With such business suit, of course, do not wear. But for an active holiday – at the time. Hamilton is now fully prepared to win in the short term the European market. The company has proven over the years range, based on Swiss automatic mechanisms of ETA colleagues concern. Yes, and has positioned itself as a brand Hamilton only inexpensive (300 – 1000 euros), which in the Table of Ranks, Swatch Group stands between Tissot and Longines. If you look at a model of Ventura Elvis and experience a slight feeling of deja vu, do not panic. No one waved in your face unknown device with a red flame, which erases the memory. Are you sure you saw this watch, and maybe not even once. It is a crescent-shaped model of a series of Ventura are heroes of the film “Men in Black.” And those hours are put in front of the camera “the most secret agents in the universe”, there were half a century ago and were the first electronic watch in the world. Then came “Quartz” version and now this model, like most in the collection of Hamilton, equipped with an automatic mechanism. Opening of the American companies do very often “removed” in the different films – from “Space Odyssey” to “Lethal Weapon 4” and “Independence Day”. So you will not find a single article of Hamilton, which would not have mentioned it, CineMark. This title is well deserved: Watch the American company had to take part in the shooting of more than three hundred films. Ventura Elvis model has the same chassis as memorable a half moon, but this time it is made in two versions: brown dial and strap or unpainted silver dial and black leather. By the way, was originally conceived as a Ventura watch for motorists, because thanks to its tapered shape, they do not interfere with your hand while driving. If we’re talking about cars, it’s time to move on to another model of Hamilton. This automatic watch US 66 Power Reserve, which are perfect amateurs. When you look at them with a black dial once you pay attention to the minute markings from 35 to 55, which imitates the speedometer cars. And the unusual red-white scale, which runs from grade 1 to 7. This stylized pointer speed engine. 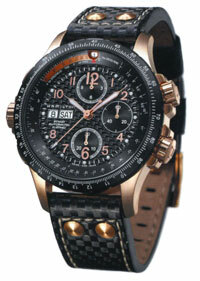 Aggressive way of hours of support “grille” in the center of the dial and black leather strap with traces of the tread. I should add that the number 66 in the name of the brand, which the Russian buyer does not look like anything other than superstition, familiar to every American. That highway under that number at one time was the only way communication between towns and sparsely populated rural areas, the United States. This road connected the Illinois, Missouri, Kansas and Chicago, and there the life is easier for farmers. 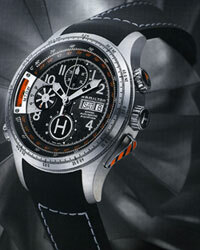 But the most interesting novelty Hamilton collection this year, you can call the watch X-Copter Auto Chrono 7750. The company’s designers thought that if there are hours for drivers, pilots, sailors and divers, why not their own models may not be the drivers of helicopters. And developed a clock that this aircraft like everything, even the smallest cog in the center of the dial, mimicking the shell plating. Different functions and ornaments of the model so much that the layman will understand immediately. Along the edge of a steel-la meringue reaches of the compass, which, however, plays a purely decorative role. Then there are two circular markings on a black background. This so-called converter temperature: the white line – degrees Celsius, orange – Fahrenheit. Hamilton managed to add another clock in the “air” indicator – on the face of this oblong bright orange box with cryptic letters MTOW (Maximum Take-off Weight) nearby. Pilots know that in fact it is a pointer to the maximum permitted weight of the load, which can not exceed. Looking at the dial of this watch, can not help recalling a series of Defy Xtreme Zenith, which was covered by a unique tourbillon propeller. Hamilton is not going to do turbiiony – a niche company understands clearly. Therefore, the X-Copter helicopter blades in the form of completed seconds, posted a mark of “9:00.” Finally, another decorative detail, which is otherwise as designers can not be called a joke: at the bottom of the dial located circle with the letter H in the center. The result was a small helipad, which make the roofs of skyscrapers and ships. In a word, not a watch, a real gift for adults romantics who still dream of the sky. Hamilton on the Russian market only two years running, but has all the prospects to stay with us for a long time. Judge for yourself: the company’s lineup is as business hours (Route 66 Series, and Ventura), and those that can be described by the word “sport” (the same Khaki). In addition, Hamilton is a product price range, which is in great demand in the market and where there is very little players.